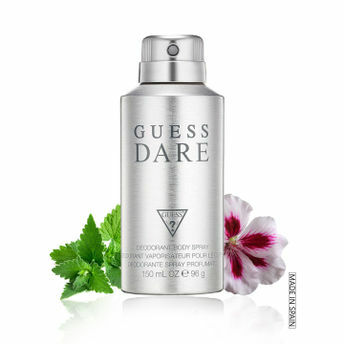 Dare, which is exciting, provoking and evokes feelings.Its floral-woody-musk composition provides a passionate cocktail which attracts attention and plays on exotic shades in sophisticated and modern way.Top notes of Guess Dare open with a blend of kumquat, lemon blossom and pear blossom, adding up to cactus blossom in the heart surrounded with wild rose and elegant jasmine. Base notes provide the exotic scent of coconut accords, while blond wood and musk soften the composition in subtle way. Explore the entire range of Deodorants/Roll-ons available on Nykaa. Shop more Guess products here.You can browse through the complete world of Guess Deodorants/Roll-ons .